Gloria and Emilio Estefan are Cuban-American singer-songwriters and superstar entertainers who have inspired conga lines worldwide. But the 100 million-plus records sold and dozens of industry awards earned are only part of their story. “On Your Feet! 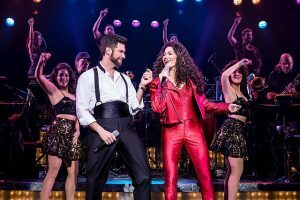 The Emilio & Gloria Estefan Broadway Musical,” now playing for Broadway in Chicago at the Cadillac Palace Theatre, is a high-spirited, glitzy production that weaves biographical events and global hits. It tracks the couple’s early struggles and discrimination, their rise to global success, the bus crash that nearly took it all away, and their incredible comeback. If that all sounds familiar, there’s good reason. The musical originated in Chicago in 2015 with its pre-Broadway engagement. On the national tour, playing the titular roles are Christie Prades as the adult Gloria and Mauricio Martinez as Emilio. Prades, born in Miami of Cuban parents, has previously played multiple parts in the New York production. The real Gloria Estefan asked Prades to lead the tour. Martinez is a Mexican actor and recording artist making his Broadway debut. The duo has palpable chemistry, and you find yourself rooting for them and the love connection that drives their music. Prades’ vocals are strong and steady throughout the show. Martinez seems to be more at home with a faster beat, but his rendition of “Don’t Wanna Lose You,” as Gloria recovers from surgery, flows straight from the heart and into the far reaches of the theater. He’s the comedian of the family, and Gloria loves him all the more for it. Two more actors of note are Nancy Ticotin and Debra Cardona. Ticotin plays Gloria Fajardo, Gloria’s mother, whose own singing career was cut short by grown-up responsibilities and who disapproves of her daughter’s choices. Cardona plays Consuelo, Gloria’s supportive grandmother, who lands several well-placed comedic punches. Happily, both have opportunity to showcase their talents as soloists in this production. The song-and-dance ensemble numbers, especially the finales, are hand-clapping good fun. At the end of Act I, the audience is engaged in a conga line down the aisles. The Act II finale is a medley of Estefan signatures. The performers’ moves are amplified by the work of costume designer Emilio Sosa who sure knows how to make a razzle-dazzle party dress. Based on an original book by Alexander Dinelaris, the musical is directed by Jerry Mitchell and choreographed by Sergio Trujillo. 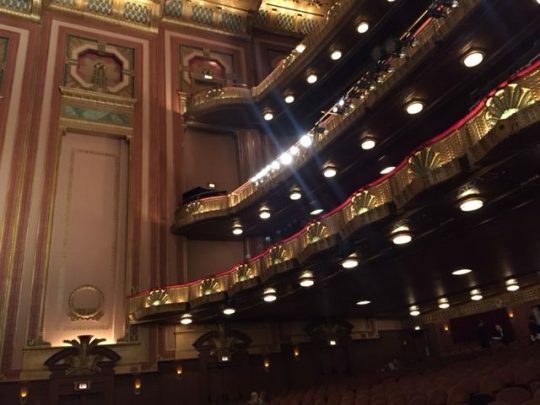 The creative team also includes scenic designer David Rockwell and lighting designer Kenneth Posner. Playing in the orchestra are several veterans of the Estefans’ Miami Sound Machine, including the production’s musical director Clay Ostwald. DETAILS: “On Your Feet! The Emilio & Gloria Estefan Broadway Musical” is at the Cadillac Palace Theatre, 151 W. Randolph St., through April 8. For tickets and other information, call (800) 775-2000 and visit Broadway In Chicago.